Contemporary Jazz mixing standards and originals. A little bop, a little swing, and some original flavor. Check it out. Into a prize so fine, white knight divine. So begins the journey, back in time and sideways in style, of Tito in Wonderland. You meet Tito in BLUES FOR ALICE, the classic Charlie Parker tune. Once again, he has lost everything to a woman certain to be "the ONE", who turned out to be "the ONE" who sold most of his stuff and then kicked him out of his own house after making him give her the keys to the car. Yet still, he cannot stop thinking of her. "Sweet SUGAR drips from her lips," he thinks, quoting from Stanley Turrentine, "that SUGAR, she's mine..."
His devoted followers and fellow band-members suggest it might be time for CHANGE. Tito remains inconsolable, sinking into despair as day fades into darkness. "It begins to tell, 'ROUND MIDNIGHT, 'ROUND MIDNIGHT. I do pretty well, 'til after sundown. but it really gets bad 'ROUND MIDNIGHT..."
Of course, there is only one cure for what ails our suffering hero. Once he meets that next "certain someone", life will again be sublime. Midnight will recede as dawn begins to light the skies, and Wonderland will be just around the bend. "Every bumblebee fills with jealousy when they see you out with me." "Your confection, goodness knows, my HONEYSUCKLE ROSE." 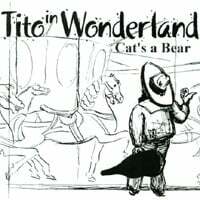 Tito In Wonderland marks Cat's A Bear's debut expedition into jazz standards. While each member of Cat's A Bear has a long history with jazz standards, the group has generally explored new and original music forms and styles, leaving the standards for conventional gigs and recordings. Bringing Joe Dorris' vocal talents to the front and showcasing four standards, this album shows the deep connection to the music that set the path for each of the players, and the band itself. The group does not totally leave behind their distinctive style of original music. Two cuts by guitarist Frank Singer, CHANGE and PRIME DUB, carry on the Cat's A Bear tradition. Both are instrumental compositions, each with a unique twist. CHANGE moves through different time signatures as part of its form, and PRIME DUB takes jazz into reggae and back again. Both tunes represent the Cat's A Bear sound. Hear that sound on TITO IN WONDERLAND, 6 tracks of jazz.